Class-leading comfort is paired with an unmatched work effort and striking good looks in the six-passenger Viking VI EPS Ranch Edition. ROOM FOR SIX: This 6-occupant machine achieves driver and passenger comfort with a class leading 115.6 inch wheelbase that smooths the ride and allows for best-in-class interior space. Both front and rear center seats are offset, as are the middle headrests, allowing for unmatched middle passenger comfort and convenience. All passengers have a 3-point seatbelt for riding comfort, and extensive noise and vibration reduction measures provide a smooth and quiet ride. Front and rear passengers also have the convenience of an integrated handhold with hand-cushions that enhance comfort. POWER STEERING: Yamaha’s proven electric power steering system on the Viking VI EPS Ranch Edition offers excellent handling over all kinds of terrain, with lower steering effort for reduced fatigue after a long day in the field. EXCELLENT GROUND CLEARANCE: A maximum 11.4-inch ground clearance delivers underbelly protection while enhancing terrainability. The Viking VI EPS Ranch Edition's width also helps minimize 30 inch row crop damage. HEFTY TOWING CAPABILITY: Standard center-mounted, heavy-duty 2-inch receiver-style hitch can tow up to 1,500 pounds. TORQUEY 700-CLASS ENGINE: The Viking VI EPS Ranch Edition is equipped with Yamaha’s powerful 686 cc engine with a broad, usable powerband. Liquid-cooling provides consistent performance, a four-valve head with 10.0:1 compression delivers optimum torque for virtually any workload, and up to a 30% gain in fuel efficiency compared to comparable two-valve designs. RANCH EDITION FEATURES: The Viking VI EPS Ranch Edition features high-quality Copper Metallic painted bodywork with a matched brown interior, silver aluminum wheels, a soft sun top, rear view center mirror, mud flaps, overfenders, underseat storage, a bed grab bar and an aggressive front brush guard—all topped off with unique Ranch Edition badging. ROOMY, COMFORTABLE CABIN: Padded head rests are included and the middle seat is set back for both driver and passenger comfort. The pass-through floor provides onboard ease of movement for getting in and out of the vehicle from either side. UNDERBODY PROTECTION: Steel skid plate under the frame provides protection from rocks and ruts and helps prevent the Viking VI EPS Ranch Edition from getting stuck. CABIN STORAGE: A latching glove box is included to store smaller items such as cell phones, wallets, etc. 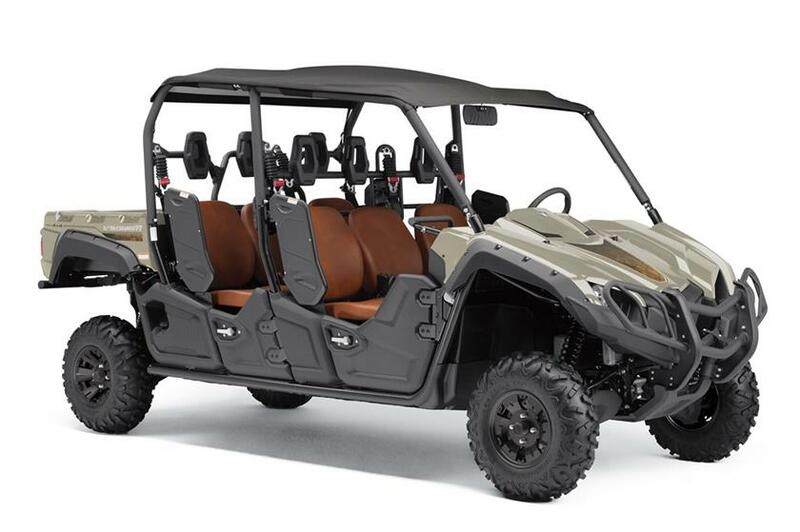 The Viking VI EPS Ranch Edition is also equipped with eight cup holders for passenger comfort. RUBBER CARGO BED MAT STANDARD: A durable rubber cargo bed mat further reduces noise and vibration while providing extra holding power for cargo. TORQUEY 700-CLASS ENGINE: The Viking VI EPS Ranch Edition is ready to conquer whatever comes its way with a powerful 686 cc, liquid-cooled, fuel injected, SOHC power plant. This engine produces strong low-end acceleration and pulls hard through the rpm range to deliver excellent power for getting the job done or when hitting the trails. HIGH VOLUME INTAKE: The Viking VI EPS Ranch Edition features a large-capacity air intake system that improves overall engine performance. The air cleaner box is easily accessible from inside the cabin for improved serviceability. RESPONSIVE AND RELIABLE ULTRAMATIC® TRANSMISSION: Ultramatic® transmission with dual-range (Hi/Lo) drive and reverse is the most advanced drive system available. An automatic centrifugal clutch maintains constant belt tension for reduced belt wear and the system features a sprag clutch for all-wheel downhill engine braking in 4WD mode and reverse. 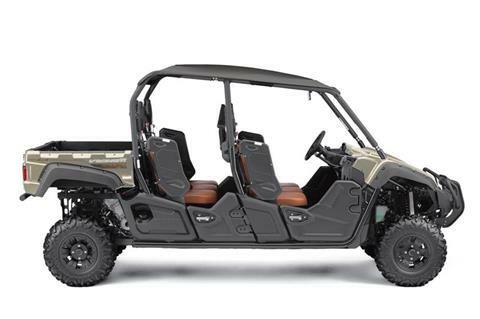 ROOMY CABIN AND CARGO CAPACITY: The chassis design includes a convenient pass-through floor for greater ease of on-board movement, making it possible to enter and exit the vehicle from either side. The rear cargo bed is made of steel and is designed for a hefty load capacity of 600 pounds. RANCH EDITION FEATURES: TThe Viking EPS Ranch Edition features high-quality painted bodywork, aluminum wheels, a hard sun top, rear view mirror, overfenders, and underseat storage.